What do original paintings of Emily Carr, A.Y. Jackson, Lawren Harris and Terrill Welch have in common? What do original paintings of Emily Carr, A.Y. Jackson, Lawren Harris and Terrill Welch have in common? 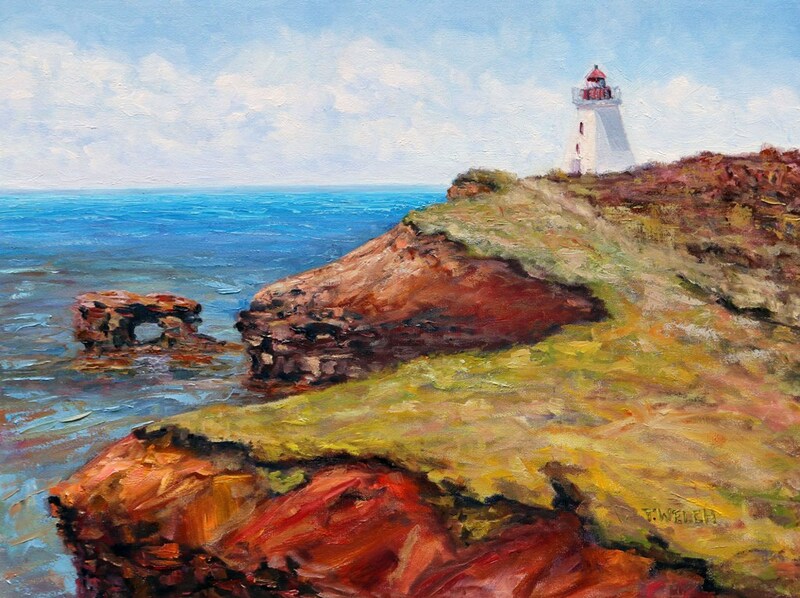 The answer is almost beyond belief – paintings by these Canadian artists are owned by the same art collectors! There I have said it out loud. I am guessing you might want to hear more about this story, yes? I thought so…. 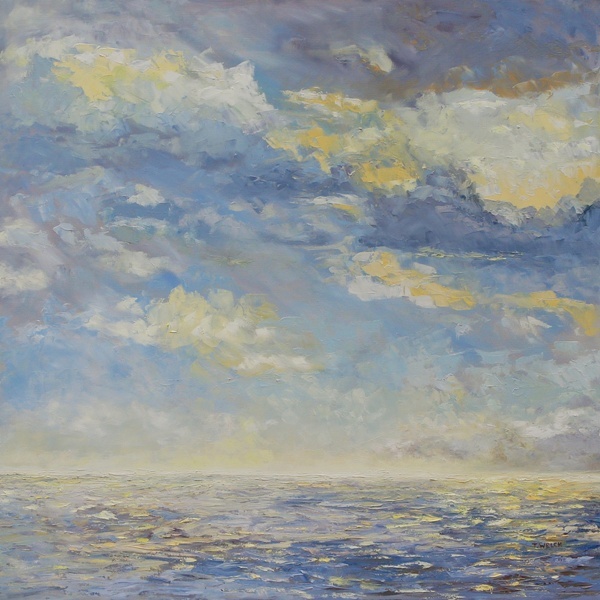 The buyers who recently purchased my large 36 x 36 inch oil on canvas seascape, “Sea and Clouds,” had mentioned in our email exchanges that they trusted I would be impressed about the company my painting would be keeping. I made a mental note from this comment that they were art collectors. I have been selling my work to art collectors of contemporary art since I was fourteen years old. Often, my paintings sell before they are even eligible for varnishing and sometimes even before the painting is dry to the touch. So this is not something new for me. But I never suspected that my painting would be rubbing corners with other such valuable collectable paintings in Canadian art as mentioned above. The thought never even crossed my mind. I wouldn’t even have been able to imagine it. Never! I paint. I muse and have imaginary conversations with these historic painters about painting problems, life as a Canadian artist and so on. But that is about it. It is all imaginary. 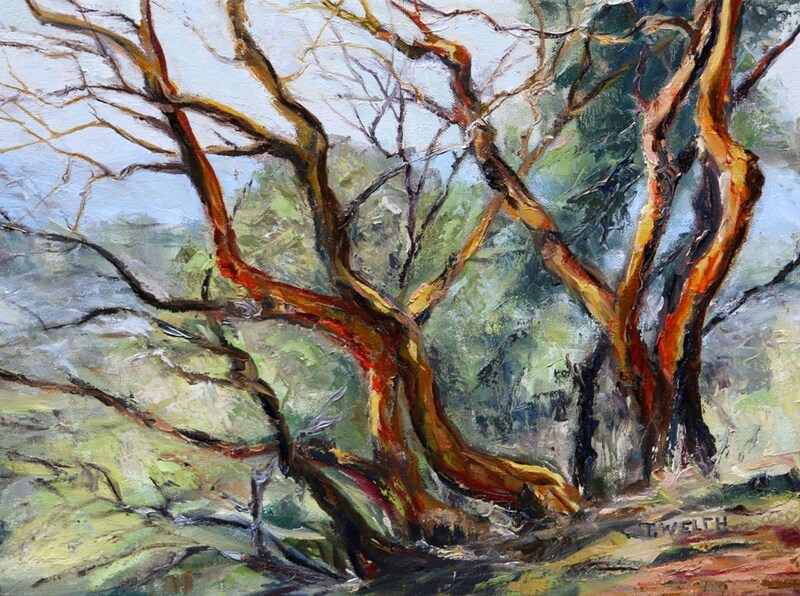 Their paintings themselves seem very distant from my daily work as an artist. When I arrive at the buyer’s home we go through the usual pleasantries and meeting of the dogs and so on. I give them a portfolio for their records with a signed copy of my art book, the receipt and a copy of the blog post where I shared the painting’s development. I then bring in the wrapped painting. I focused on meeting the new owners and getting my bearings. I am always a little nervous meeting new people and new buyers of my work. I have decided it is a perfectly normal human response. Though admittedly, the nervousness could have something to do with the days and weeks I spend working alone in my studio on an island and seeing few others in person beyond my husband. The new owner of “Sea and Clouds” helped to take the coverings off the large painting. 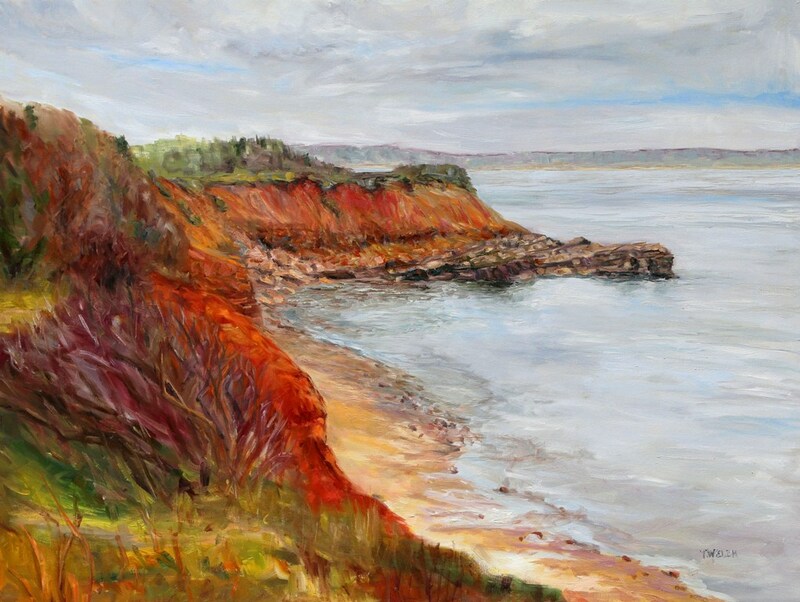 Though the painting was back in my studio when the couple contacted me, it had been shown over the summer at the Bennett Bay Bistro in the Mayne Inn. This is where they had first seen and admired the work. Then the art collector walks across the living room with the painting and leans it safely against a cabinet on the far wall. I didn’t hear the rest of what he said. I am stunned. 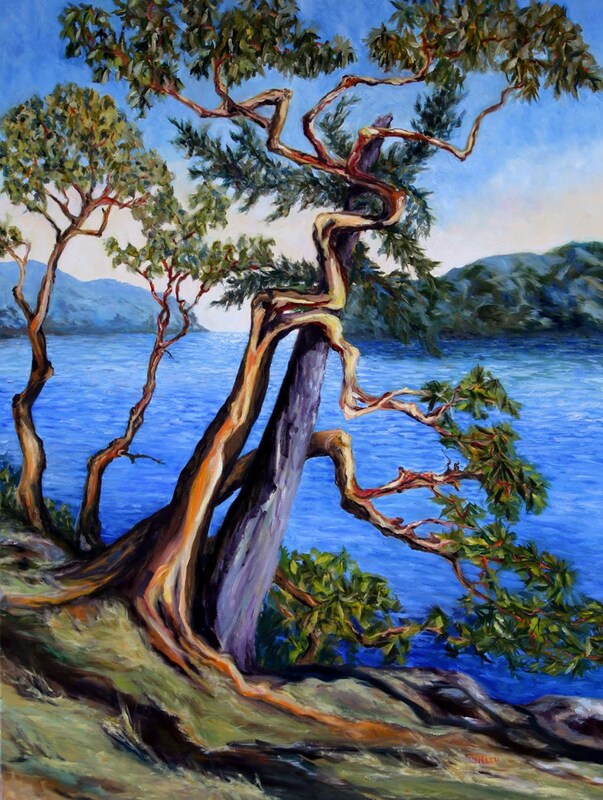 I look up to the painting above where he had set my painting and there was a large Emily Carr Painting – Emily Carr! The same Emily Carr who is my personal muse and mentor. The same Emily Carr who is the painter whose art journal I read regularly whenever I feel isolated and doubtful about my work. It is the same Emily Carr who is a prominent part of Canadian Art history. It is the Emily Carr whose painting sold at auction last year for an unmentionable number of dollars. 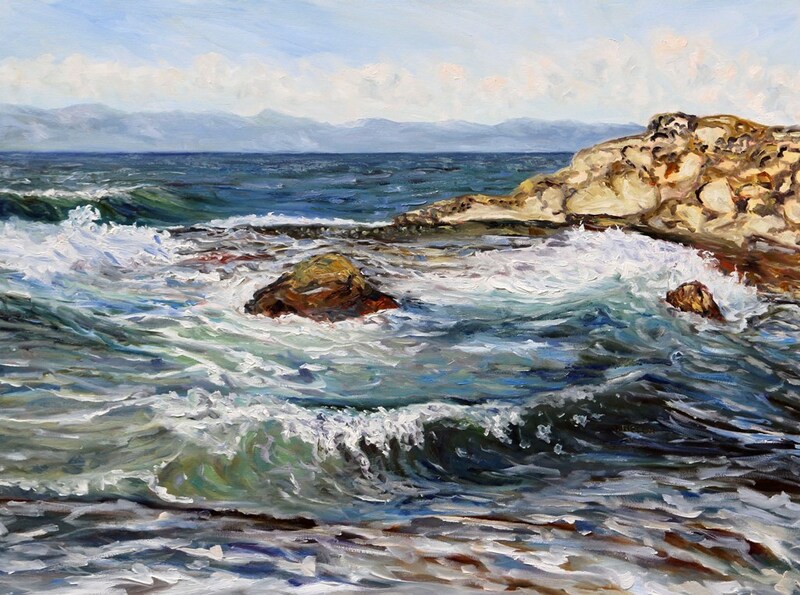 It is that Emily Carr – the same one. Emily Carr my kindred spirit. 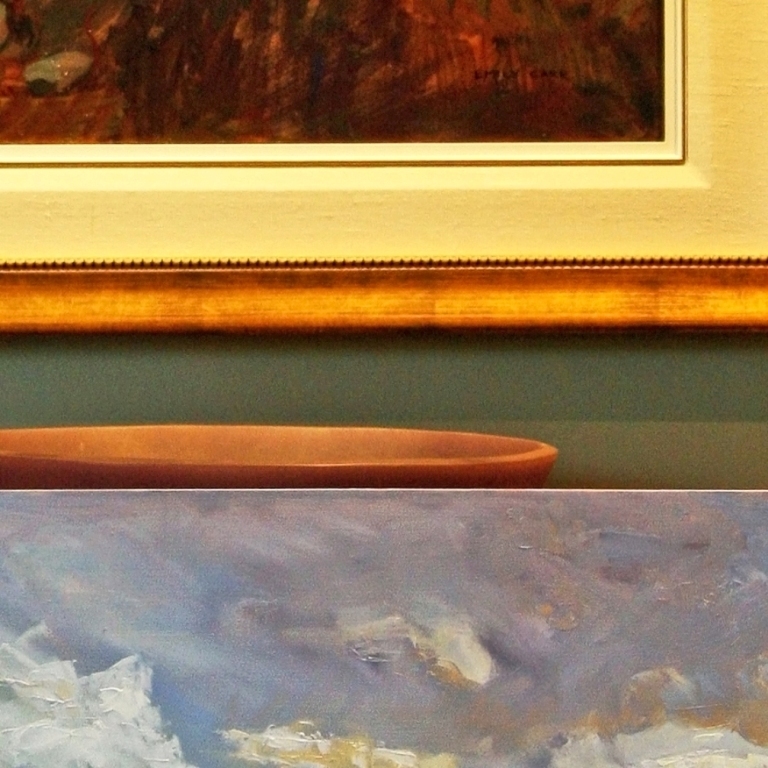 Her painting is now hanging just above my painting that is leaning against the cabinet in the art collectors’ home. It took me several moments to gather my wits about me as the art buyers showed me other Canadian works by painters from the same period. I finally seemed to be able to engage my stunned brain by the time the buyer handed me a small A.Y. Jackson study to have a look at. At this point, we talked about painting studies, process and brushstrokes. The couple told me about the Lawren Harris painting they have and how it didn’t look like much until a person stood back from the painting. It looked like just paint up close. They tell me it is an artist’s vision not the number of brushstrokes that makes a quality painting. I could have reached out and hugged them both for that comment. I knew my painting was going to be in a good home with this lovely, warm and generous couple. 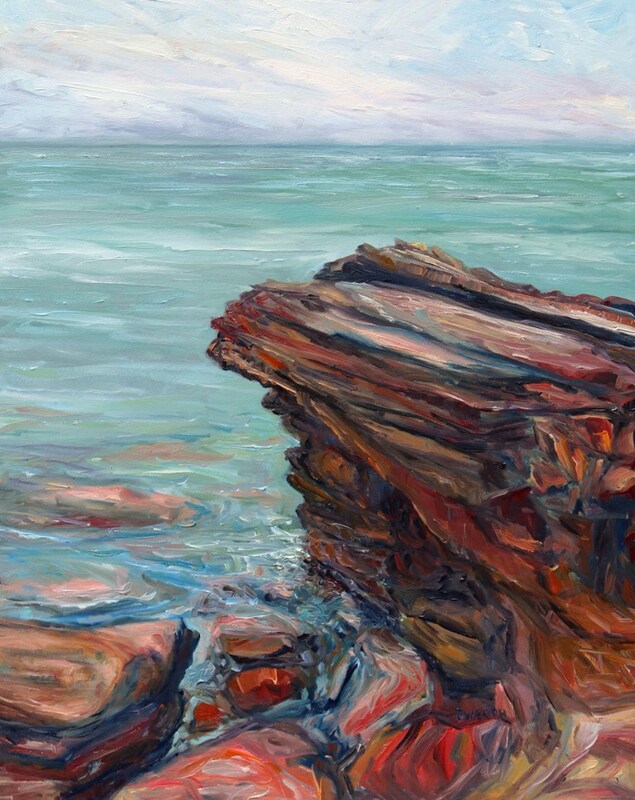 As a Canadian landscape and seascape painter, there is nothing I ever want for one of my paintings than to be bought because the buyers love it – such as it is with this painting. 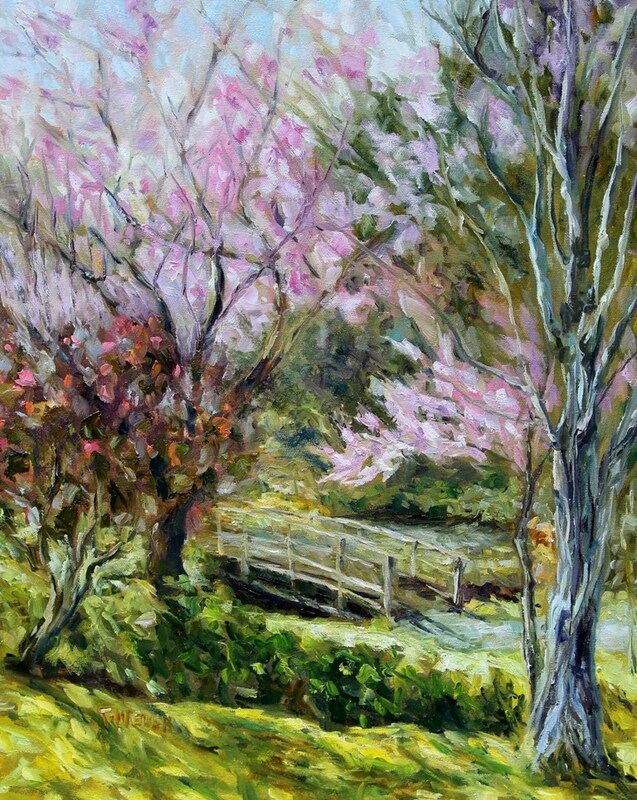 It is an unexpected and pleasant bonus to have one of my paintings collected by those who also love and enjoy the most prominent historical Canadian art work that also has influenced my own painting, not so much in style but as in preferred choice of subject matter – the Canadian landscape. It was a good day for this artist. A very good day indeed. I am taking a bow for the love of Art and the Canadian Landscape. Will you join me? Now I am back to painting and preparing the underpainting for a new 4 x 5 foot canvas. More on this in the near future. Thank you to all of you who continue join me on my painting and photographic journey here at Creative Potager and elsewhere. You are the best and a big part of what adds value and connection to my everyday life as an artist living on a small island off the southwest coast of Canada. May your today bring with it creative abundance. If your creative work could enjoy the company of other historical prominent mentors, in your wildest dreams, who would it be? © 2012 – 2015 Terrill Welch, All rights reserved. Terrill – I’m so proud of you I can’t even see straight. I’m sure your feet still haven’t touched the ground. Oh my goodness sakes alive! SPROUT: If your creative work could enjoy the company of other historical prominent mentors, in your wildest dreams, who would it be? From an energy work aspect, the answer is Carolyn Myss and Donna Eden. From a spiritual aspect, the answer is Wayne Dyer, Pema Chödrön, and Eckart Tolle. I have had to tie one of my ankles to the top of the nearest fir tree Laurie just to stay below the cloud cover 🙂 I am trying to be all calm and objective but it isn’t really working very well. You have given words to your wildest dreams and nothing makes them more possible than telling others. So here is to the best of dreams coming true! thank you, Thank You, THANK YOU for adding your energy to dreams come true. And congratulations once again. I’m over the moon for you! Oh I like your list Leanne. There are a few of my own favourites on here such as Jane Urquhart and Margaret Atwood. Nice! May your wildest dreams come true! How exciting. What an experience! Proud of you, Sis. In answer to the sprout question…it is Robert Bateman that comes to mind. I have several of his books that I periodically thumb through and admire. I know Sue! Still having a hard time believing it is so. I might have been able to guess that Robert Bateman would be your choice – an excellent choice too! May your wildest dream one day be so! Wonderful news. This is a delightful blog to read. Congratulations. You, your work deserve to be honored in such a manner. I’m very happy for you. And I must add, what a delightful couple to spend time with. If only there were more people who appreciated the arts as they do. Congratulations Mom! This is so cool. What an accomplishment. I have been thinking about it lots since we talked on Saturday! I am giving you a standing ovation – what a lovely honor and I am so pleased you shared it with all of us. I do not have a mentor/ muse right now. In my earlier days I might have said Gloria Steinem or Karl Jung…I admire a number of people now, and think I do not need to be important in history. Maybe someday someone will say – where is that neighbor gone who cleaned out the gutters and the storm drains? In my youth, I wanted to be just like Julie Andrews – now I am we both can not sing anymore because of tumors! In the middle of reading this, my female golden retriever decided it was time for her walk and nothing I was going to tell her was going to stay her enthusiasm, it was time! Much like your message here, it was time, time to have this experience, time to know your working is worthy of rubbing corners as you say with other fine painters. I only know Emily Carr through you and this blog , hey I am not a Canadian ! I love this story, I love your experience, your humbleness and awe! Sea & Clouds is a beautiful atmospheric expressionist painting, soft and gentle yet moving and powerful! It deserves a place of honor! Recently, it seems we chatted on FB about good omen’s … I think we were right! This is a wonderful discovery and certainly must be part of your memoir one day. The painting is gorgeous and the artist is inspired. What more does anyone need? Only this quote from Michelangelo: The true work of art is but a shadow of the divine perfection. The first thing that comes to my mind is the sensory, emotionally textured work of cinematic stylist Terrence Davies, who at this time may be the world’s great director, or at least one in the upper tier. There are a number of priceless treasures here. This could well be the only motivation for us to break the law! Ha!